I made him some Funfetti cupcakes to enjoy when he gets off of work. Apparently my cupcake pan has ran off somewhere... So I had to put the paper cups in a large baking pan. It all worked out. We just have square cupcakes now instead of round ones. Mmmm... The apartment smells sooo good! ...I ended up eating one, I couldn't help it! Happy Birthday to Josh. And if I wasn't rapidly going down hill with what my son had yesterday, I would want one of those cupcakes! 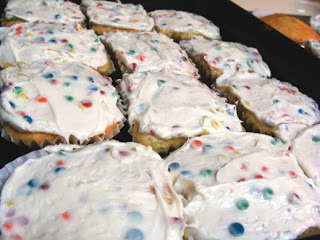 I think square cupcakes are COOL! Happy Birthday to Josh! Hope it was a good one. Hope you guys had a fun night! I have to admit there is a gulp when you cross over that 25 hump!I will in July and I am a little shocked that I will only be 4years from 30! How did that happen?